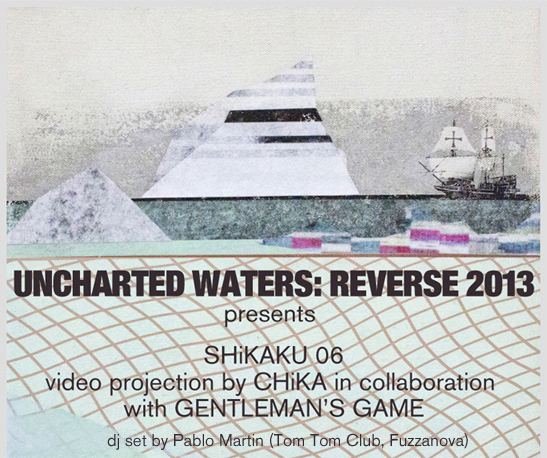 SHiKAKU 06 is the latest video sculpture by CHiKA created in collaboration with Gentleman’s Game. On Friday May 10th SHiKAKU 06 will be projected onto REVERSE’s store front facade accompanied by a DJ set by Pablo Martin of Tom Tom Club and Fuzzanova. SHiKAKU 06 is part of CHiKA’s ongoing project, SHiKAKU, a Japanese homophone that translates to “four square,” “visual,” “optic angle” as well as “blind spot.” Embracing these themes and variations, works from this series take the form of interactive projection mapping installations that explore the relationship between the optical components of the work and light, sound and the audience. Gentleman’s Game is a collaboration by Brandon Friend and Jason Douglas Griffin. The two artists deconstruct and rearrange pictorial information extracted from the media. Working with found objects, collage, and paint washes, and using print-making, image transfer and silkscreen printing techniques, they achieve a unique detailed multi-dimensional and richly layered aesthetic. Uncharted Waters: REVERSE 2013 presents work in a variety of media, including installations by Melissa F. Clarke and Daria Irincheeva, two-dimensional works on paper by Alex Yuzdon and Gentleman’s Game, and video projection by Chi KA. While formally different, these works demonstrate a shared interest in investigating unfamiliar topographies and the creative challenges of visualizing places that have yet to be discovered. Through the appropriation of old maps and travel images or the translation of cartographic postulations into three-dimensional spaces, the works presented in Uncharted Waters explore novel ways of traversing the boundaries of our everyday environments.